"What's the best thing about being a chef? It's being able to name your dishes anything you want! The exotic, tropical tang of the fruit and the richness of the wild salmon work wonderfully together. The 'bango' comes from the spicy sweet pepper jam I use to bind the fresh mango relish." Stir mango, lime juice, pepper jam, and cilantro together in a bowl. Cover the bowl and refrigerate for relish flavors to combine, about 30 minutes. Season salmon fillets with sea salt. Heat oil in a large non-stick skillet over medium-high heat until oil begins to smoke. Place salmon, flesh-side down, in the hot skillet and cook until edges are just starting to cook through, about 2 minutes. Flip fillets, remove skillet from heat, and let fillets sit in the hot pan until cooked through, 2 to 3 minutes more. Transfer to a plate and top with chilled mango relish. I used a homemade habanero pepper jelly because that's what I had and dusted the salmon with a bit of jerk seasoning. So fresh and simple. This was fabulous! Will make again. 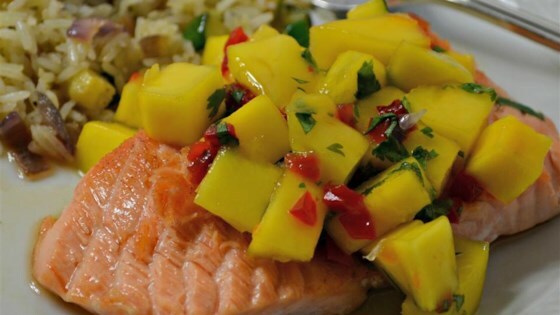 The mango and the salmon go so well together. This was delicious! The salmon was done quickly and was very moist. The salsa was amazing. Why go out to eat? I used peach jam and a pinch of cayenne and chili powder as a handy substitute for the chili pepper jam. Made it to the recipe except I couldn't find the Ancho pepper jelly so I had to use just a red pepper jelly. It was really good on the Salmon.